I have spoken before about the pain, the suffering of the self-imposed food puritanism and rigidity that comes with being Italian, in a world of teriyaki chicken pizzas and hot-dog stuffed crusts and canned ravioli. Of course, there is a danger with a food culture that it’s as romanticised as the Italian one. It’s easy to succumb to a specific kind of snobbery, forgetting that, you know, Italy is an ever-changing industrialised country where people have 9-to-5 jobs and have to pick dinner on the way home, like everyone else. Of course, as a country blessed by the sun, the choice of locally grown produce is staggering compared to Britain, and a trip to the greengrocer brings back bountiful paper bags of fat, ripe tomatoes, bitter leaves, pink-hued radicchio and red-skinned potatoes. And yes, if I look back at my summers growing up, I could fool myself into believing that our life was at one with nature. July in the Alps, creamy polenta and hearty stews, blackberries picked from the garden and eggs collected from the pen, still warm, the yolks beaten with white sugar eaten while sheltering from the summer storms. And the late August days spent in the Marche region, in a lonely house in a village of little more than a dozen lonely houses, the wind suddenly becoming chilly in the evening, lunches and dinners in the garden holding onto the paper plates to make sure they didn’t fly out. We’d pick thick-skinned, knobbly small cucumbers from the plant and lazily chew on them while granny heated up plump cannelloni filled with ricotta and spinach; the tomatoes picked from the vine, crimson-red, would become a simple salad or be roasted in the oven with a filling of breadcrumbs and herbs. The adults would drink acrid-smelling wine which my granddad used to make and then mix with a generous dose of soda. In August, passata would be made for the year. I remember the garage, a pot as big as a bathtub, the grown-ups sterilising beer and wine bottles, and then the enticing smell of soffritto and tomatoes, my granddad and uncle standing around the pot, my granny stirring with an oversized wooden spoon, the orange and yellow plastic funnels, hundreds of bottles being filled and capped, and ending up in boxes in the back of our car for our trip back to Rome. We would never buy passata; it would always be in the pantry in label-less beer bottles. At the same time, there were a lot of foods in my childhood and teenage years which were far less pure and virtuous. There were icy Calippos in the summer, melting into sickly, sticky syrup; frankfurters in tomato sauce served with pasta; gloopy burrito sauce from a jar for our “Mexican night”. Friends’ parents have made me the sort of pastas which, if presented as a video recipe on a Facebook page, would lead to an uproar of outraged, angry Italians (think tuna and parmesan). For dinner, we had sofficini and fish fingers with frozen peas. And one of the first dishes I ever made was pasta with sausage, cream and mushrooms. Yes, you heard it. Cream. Cream is a bit of a controversial ingredient for us Italians. If you’re from Northern Italy, chances are you have at least dressed your tortellini with it; if you’re me, you’ve spent the last few years in a relentless battle to explain to the world that CREAM-DOES-NOT-BELONG-IN-CARBONARA. But, guess what? You can put whatever you want in your pasta. It’s yours to make and shape and transform and enjoy. I’ve recently watched Ugly Delicious on Netflix, a documentary which has left me with more questions than answers about the idea of “fusion” food. More than anything, it’s made me realise that especially with something so integral to issues of class and race, our relationship with authenticity is flawed and full of contradictions. In the first episode, an Italian-American pizza maker claims not to care that a pizzaiolo from Naples would not see his “pie” as proper pizza; he is however outraged when David Chang orders Domino’s. Also, he says “pie” a lot. A lot. David Chang himself sees no issue deconstructing European food and creating whatever food he likes, but is far more reticent when it comes to kimchi appearing in mainstream restaurant menus. We’re ok messing with other people’s food; we’re unhappy if someone messes with our food. And as much as Italians are culprit of this, remember when the Brits kicked off because Americans though they had invented the sausage roll? So today I am going to mess with my own food. There is a particular kind of Japanese food, called “yōshoku“, which literally means “western food”. 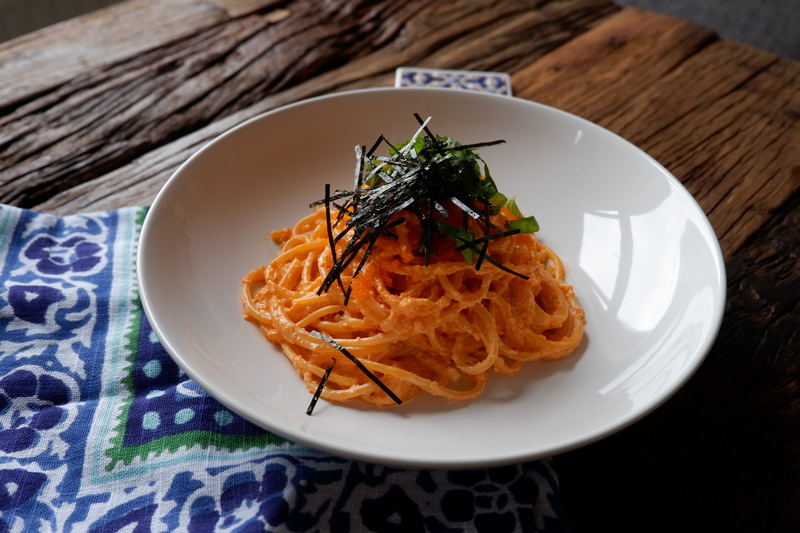 It has spun universally-loved dishes like Tonkatsu, but also to a whole variation of spaghetti which would give your average Italian goosebumps. While I was not quite ready for the ketchup-and-sausage “Naporitan” spaghetti, I attemped Wafu Mentaiko pasta, which pairs spaghetti with – yes – cream. Oh, and cured cod spicy roe. Shiso leaf. Seaweed. You know, the lot. 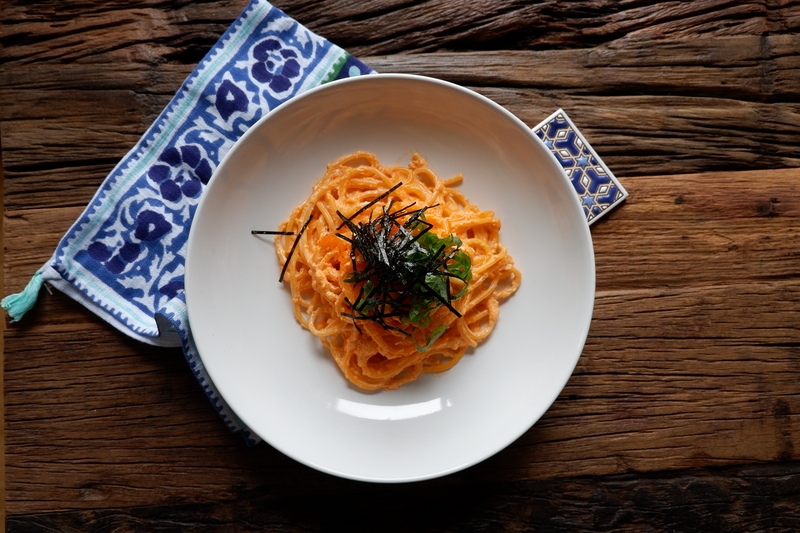 Pasta with fish roe is not unheard of, and bottarga is very commonly used as a pasta sauce. In this case, because I could not find mentaiko, I opted for a vibrant orange fish roe and added some chilli flakes for a punch of heat. 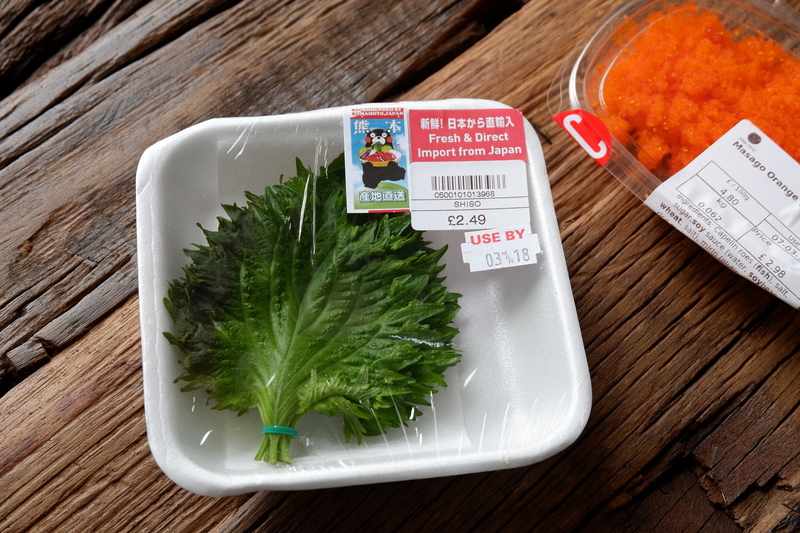 The result is creamy and delicate, with the beautiful texture of fish roe almost popping under your teeth, and the aniseedy brightness of shisho. I adapted the recipe from a couple of websites, like this and this, but have decided to use a more traditionally Italian technique by making the sauce on the heat rather than adding it to the cooked spaghetti still cold. Cook the pasta as per packet direction in a large pot of salted water. In a pan, heat up some butter or olive oil, add the garlic and roe and let it fry lightly for a minute or so. Add the cream of extra butter, a dash of soy sauce, and some black pepper; mix well and remove from the heat. When the pasta is cooked, drain and add to the pan with the sauce, on medium heat, until it’s well coated. Garnish with some extra roe, the shisho and the nori.